The link below is from the AU Athletics site & will have results as they happen. 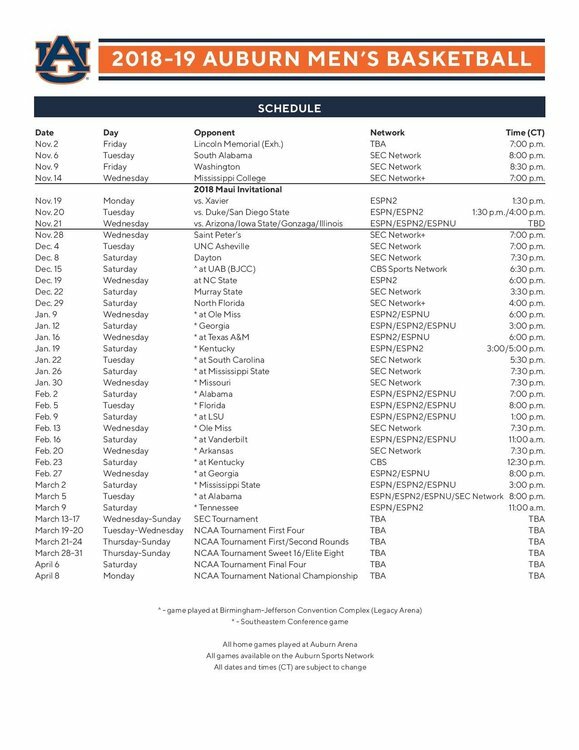 Below the link is a JPG file of the season schedule without results. If you can't read the schedule well click on the picture & the picture of the schedule will be Zoomed for you. Neither team appears to have the energy we have. They are either both very tired, or not as good as I expected. Vandy PG play looks very average. They have played a zone the entire first half. NC State has not shot them out of the zone. They have continued to penetrate and score. Shittou is going to be a tough match up at Vandy. Fr 6'-10" 240 lbs and runs like a deer. He got skills. Can run, handle the ball, good passer. Arizona @ UCONN at noon CT on ESPN2. Mizzou hosts UCF at 2 CT on ESPNU. Washington hosts Santa Barbara at 7 CT on PAC12 Network. Watched Michigan vs Purdue this weekend. Michigan routed them relatively easily. Commentators who were in Maui felt that Michigan would handle Auburn and battle Duke or Gonzaga. I felt our quickness and ball pressure defense is superior to Michigan as is our overall depth. Hopefully we’ll get a chance to show our stuff in March. agree....things might change but seems they are skating along based on their name right now. UT looks good but they are our last game of the regular season and that could be a huge game for both schools....nice that it is at AU. I just see them as a bunch of individuals that haven’t been molded into a team yet. Lots of talent and time to do that left in the season. All 3 AU season opponents won yesterday. Mizzou beat a UCF team that recently beat Bama. The guys mentioned aren't close to the same calibre of players that he's been getting in the past. The guys that aren't as physically gifted or talented are harder to win with. Irrelevant. We are only discussing Cal developing UK players at the moment. Don't think anyone is saying or implying that at all. That being said, yes the 3 players mentioned are 5*s. However they are ranked between the 15th & 26th best players in their class. Seems to me basketball is a sport where there can be a world of difference in a top 10 recruit which UK frequently gets & a 15-30th ranked recruit talent wise. Given there are only 2 rounds in the NBA draft it seems logical to me the sites need to limit 5*s to the top 10 players in a class instead of keeping near 30 like football who has 7 rounds in their draft.